If you know anything about colour theory then you will know that Red, Green and Blue are the primary colours. All other colours can be created from them and if you meet them at full strength you end up as white. They are the main colours that you see on all electronic devices. Red, Green & Blue was another of the topics in the 2012 Interclub Challenge. I decided very early on that I want to show the colours merging into white as one entry, and that I wanted to use a model. The original concept as shown in the photoshopped image was discussed with a makeup artist, and I had a model agree to do it. It never came to fruition as it was going to tie people up for too long and also be expensive. It was then that I say an illustration that used fabric and when I showed it to Maya (my model) she loved it. Now ribbons are also expensive but I managed to find satin material that I could cut up and then press ganged my daughter into sewing together into long ribbons. This gave me more than enough material to play with. The only draw back was that the satin freyed and so left little threads everywhere. We decided that we were going to shoot two different concepts. 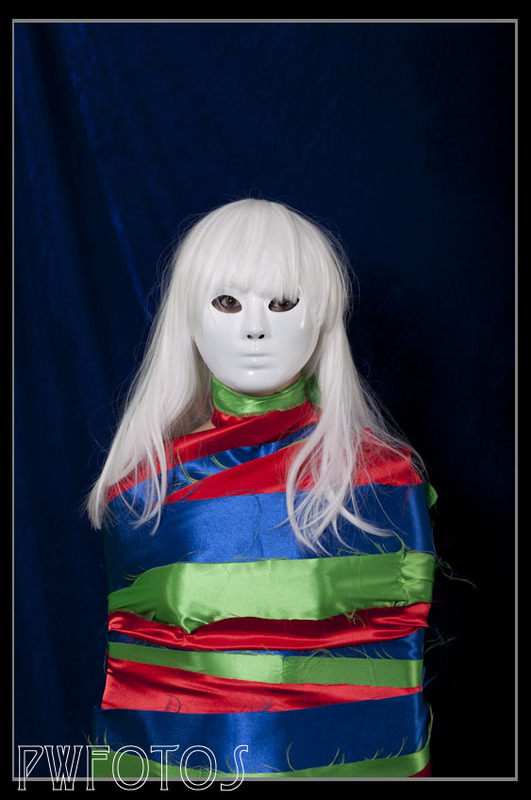 The first would be similar to the illustration and we would simply deploy each of the ribbons in a light wrap. This is the shot that came about from that concept. Then in the second series I would bring in the concept of the colours mixing into white. I had obtained a full white mask and a white wig. Maya was very accommodating because it took me and her friend Holly nearly 15 minutes to completely wrap the ribbons around her. It probably would have not been that bad for her if we had not started by putting on the mask & wig. The final image was manipulated a little in photoshop to really make it “pop” and I hope that it has the dramatic effect I was after.